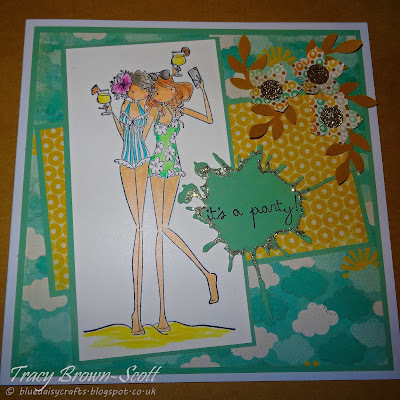 Blue Daisy Designs: It's beach party time! Well, actually, no.. not beach party time here in Scotland. Sorry, lol!! But the weather has been ok.. well, in Shorpshire it has! Spent a lovely weekend doing real family stuff with relations from all over coming together for a lovely weekend! We hired a lovely cottage and just chilled out. Went to visit family and were joined by cousins from all over .. amazing to meet the newest member of the clan at just 5 weeks old! So now just enjoying the rest of the bank holiday weekend with a quick make to share. A Stamping Bella coloured with Copics.. I'm going to link to a few challenges as I'm catching up! Yep, definitely s bit cold for the beach still but your super card and image at least reminds us of warmer days to come. It's lovely to see you at Stamping Sensation this month, many thanks for joining in. Wonderful card, love the Stamping Bella stamps. You have coloured them up beautifully and your design is spot on. Cute and fun card, great image, colors and accents. Thank you for joining us at PDE Linky Party. What a fab card... love the cute image..Thank you so much for joining us at A Beautiful Mess. A fabulous card, Tracy! It mihgt just have been warm enough to dip our toes and have a little paddle yesterday and today! Thanks for joining us at Stamping Sensations this month and good Luck! This is such a fun and vibrant card - great colors!